We received very positive feedback on the simple chicken dishes we have been preparing at the dinners / parties we have hosted off late. The simple Yogurt Pepper Chicken and Haryali Chicken have been our go-to options to prepare a quick chicken snack that is liked pretty unanimously. To continue adding such recipes to our blog (and in turn our party menus) we have been searching around on other blogs and talking to other expert cooks in our social network. We finally found another wonderful recipe! 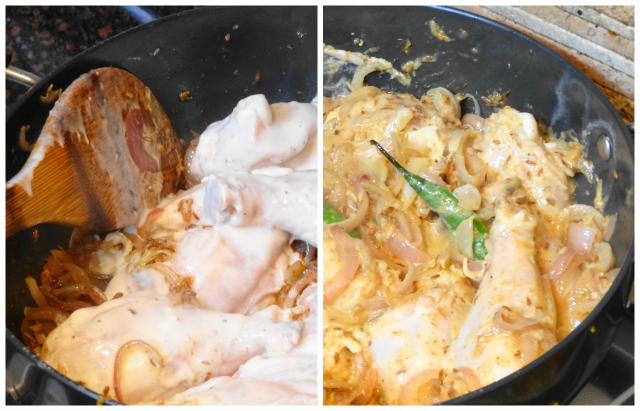 The simple Jeera Chicken brings in this unique Indian flavour, and we brought in our own twist by adding lightly tossed onions to include a bit of dry masala to the tender chicken pieces. Slurrp! 1. Marinate chicken in lemon juice, salt and yogurt. 2. In a pan, add 2 tsp of ghee. Add jeera, Green chillies to it. 3. Grind ginger and garlic into a paste and add to the pan after jeera crackles. 4. Add sliced onions and the roasted jeera powder. 5. Now, add chicken to pan and roast on high for 2 mins turning sides. 6. Now add marinade to the pan, cover it and let it cook on low flame for 5 - 10 mins. 7. Add few sprigs of fresh coriander and cook it on high flame and remove lid. Hey..Thanks. We will definitely try your recipe!